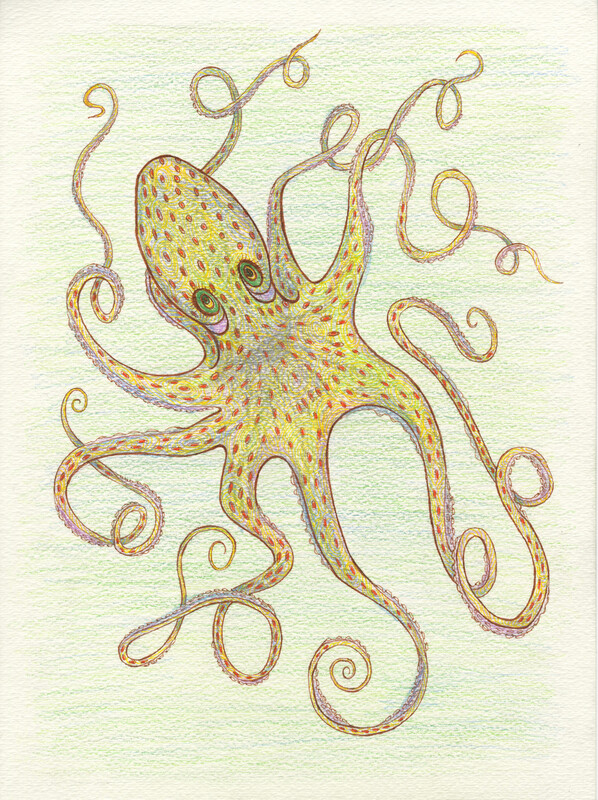 “Oli Octopus,” designed by Meredith Eliassen, 2015. Someone I know is writing a biography of Arthur Rackham, so the Edwardian artist has been in my thoughts. I have to admit that Rackham’s work was a big influence on me as a teenager. Rackham had a delicate constitution that led him to leave high school as a teenager. He traveled to Australia with family friends where he recovered his health. His illustrations resonated with me as a teenager because I believed that he really saw the spirits; he clearly had an affinity for fairy tales and an eye for fantasy. Roughly contemporary to Siméon Pelénc (1873-1935) but working in very different design ecosystems; both were responding to realism (or verismo) in art; Rackham’s market niche was established in the expensive gift book market (popular in America) that waned in the Interwar years in England. He enjoyed a huge adult following, but the war had brought such a deep level of disillusionment that fairies and fantastical were beyond the realm of verismo that carried art into a guttery lurid place. During World War I, his wife Edyth (often described as his opposite: beautiful and daring) was struck down by pneumonia and subsequently had a heart attack that substantively weakened her. Their small family moved to a farmhouse with few amenities in the Sussex area. Though he looked wizened, Rackham was physically active, walking and cycling daily. To spend time in the natural world without luxuries, we take for granted the imaginary landscapes that can appear when the material senses are silenced. 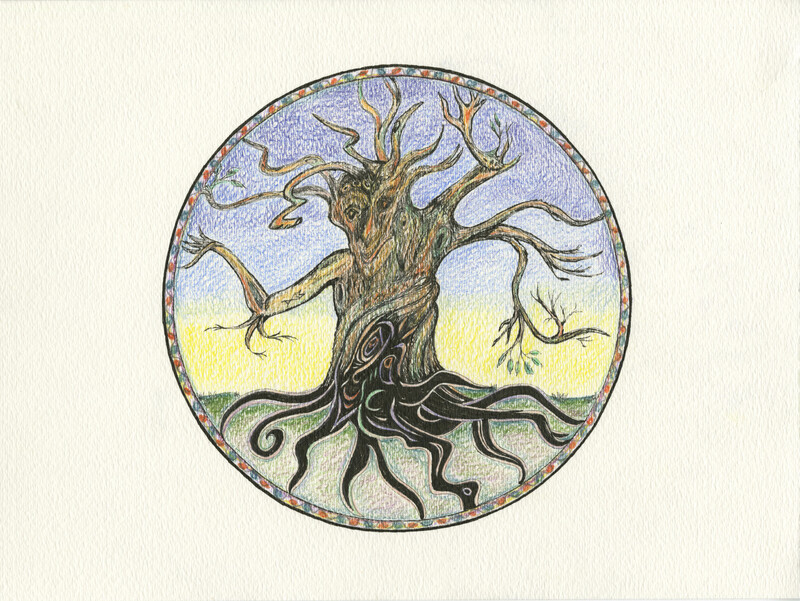 “Rackham-esque Tree,” design by Meredith Eliassen, 2015. Over the weekend I drew the above image that was definitely inspired by an illustration by Arthur Rackham in The Legend of Sleepy Hollow by Washington Irving (Philadelphia: David McKay Company, 1928), and the quote describing Rackham’s fantastic tree appears on pages 82-83. I have wanted to see Mascagni’s Calalleria Rusticana for a while and since San Francisco Opera has not done it, I thought I would try the Metropolitan Opera in a theater. It was a wonderful experience that I would recommend. You feel like you are in the Met with a back stage pass. I will definitely go again. The production was fabulous and intelligent. I won’t do a critique other than to say they made it real. Verismo (realism) refers to the late-nineteenth-century Italian movement of the giovane scuola (young school) in literature, art, and music towards naturalism by spotlighting the passions of working class men and women. Pietro Mascagni (1863-1945) ushered in the Italian verismo movement with his masterful one-act melodrama Cavalleria rusticana, which introduced audiences to the passions of Sicily. Mascagni’s success spawned other artists to produce similar one-act operas that introduced fierce and sordid emotions including lust, betrayal, hatred, and even murder. Mascagni came from humble roots, he entered his composition for Cavalleria rusticana in a competition to write a short one or two-act opera and was the winner. Introductory woman’s chorus: The orange trees in the green groves scent the air, the larks sing through the flowering myrtles; now is the time for everyone to murmur the tender the tender song which quickens the heart. “Cavalleria rusticana” composed by Pietro Mascagni, 1963-1945 with libretto by Guido Menasci and Giovanni Targioni-Tozzetti. Drawing by Meredith Eliassen. The drama is hot when Santuzza learns she has lost her lover to a married woman named Lola, and it gets hotter when on Easter morning Santuzza informs Lola’s husband of the affair. Siméon Pélenc was born and raised in Cannes, France. He hoped to become an architect and was an accomplished draftsman, but perhaps was best known for his murals and opera set designs. He settled in San Francisco, California in 1916. A study of San Francisco city directories indicates that Pélenc did not advertise as an artist for several years while he taught French to journalists in the Chronicle Building. By 1925, he occupied a studio located at 728 Montgomery Street and resided with his second wife Helen at various locations adjacent to the French Quarter. Pelénc was a scenic painter who worked in oils and temperas. Some of his early work employed pointillism, a technique of painting in regular dots or small dashes of pure color, which from a distance created a vibrant effect. However, he was best remembered for introducing Italian sgraffiti techniques of mural painting to California. The Northern California Chapter of the American Institute of Architects invited Pelénc (who was a member) to participate in Exhibit and Honor Awards for Craftsmanship in efforts to revive “the splendor of fresco and sgraffito” in the region in 1927, 1928, and 1929. “The word, “fresco” comes from an Italian word meaning “wet” or “damp” and the fresco painter does not paint his picture on the wall it is meant to adorn; he makes it become part of the wall, in the same manner in which nature makes marble — by adding mineral pigments to the plaster while it is still wet. 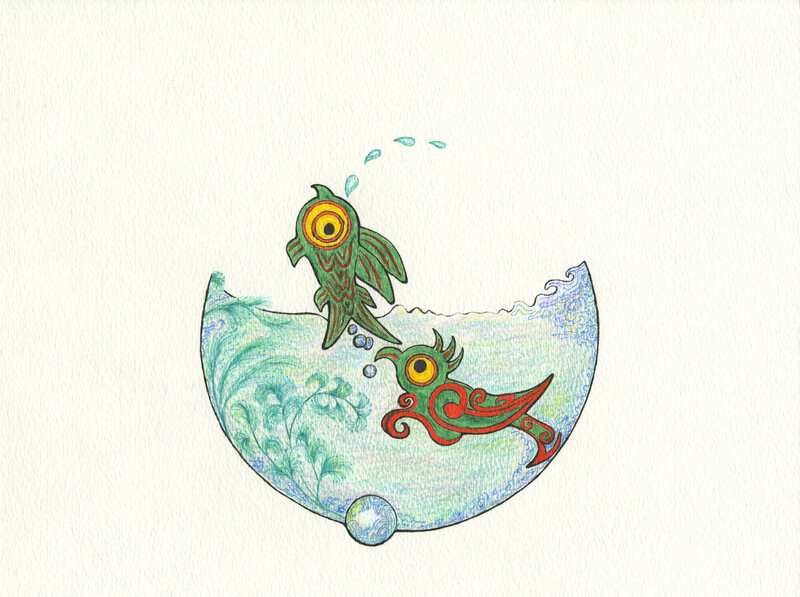 I have found that researching Pelénc has made me want to draw with less realism. The following picture was inspired by a German example of ceramic sgraffiti with light/dark reversed. 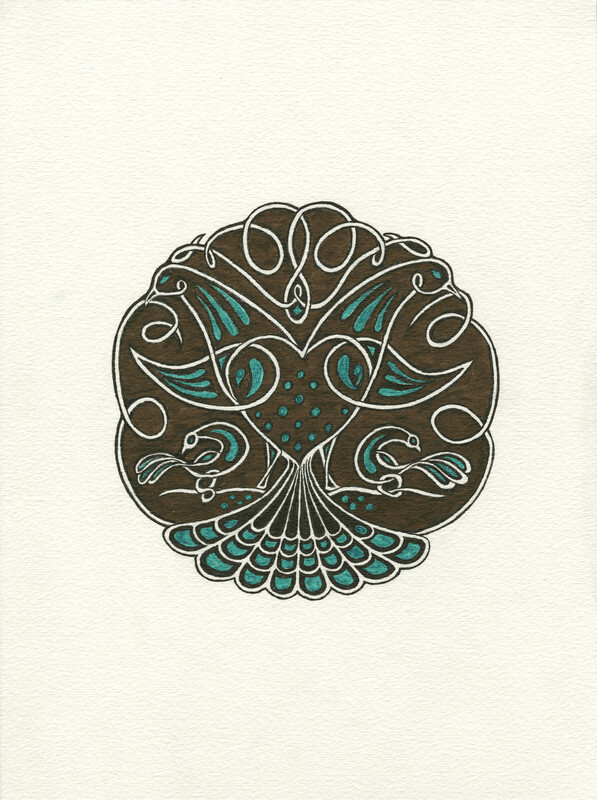 Four birds in a stylized design by Meredith Eliassen, 2012. As we broaden our view to celebrate Earthday today, let’s also consider ourselves within a more universal context. Happy Earthday, Everyone!!! 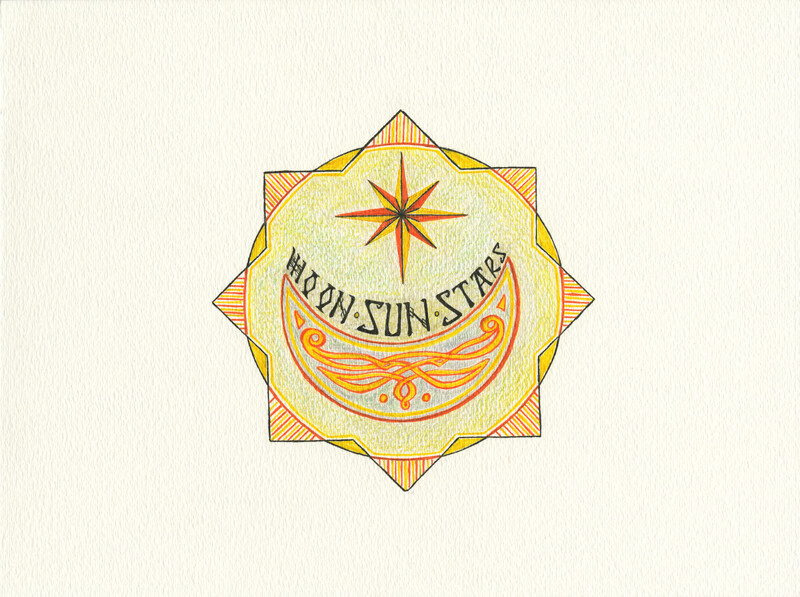 “The Celestials” all together: Sun, Moon, and Stars. Design by Meredith Eliassen, 2015. Big news! I did my first 5K and finished. My reward was a free concert (part of the Morrison Artist Series) by the Julliard String Quartet of Haydyn, Shulamit Ran, and Beethoven with a Schubert scherzo. Awesome! It was virtuosity times four. It is easy to forget how powerful the sensory experience of live concerts can be, and this should always be available. I came with expectations and was shocked how the Ran affected me. Thanks Julliard boys! You were exquisite. And thank you Morrison Artist Series for bringing these concerts to San Francisco for the public to enjoy! You rock!!! 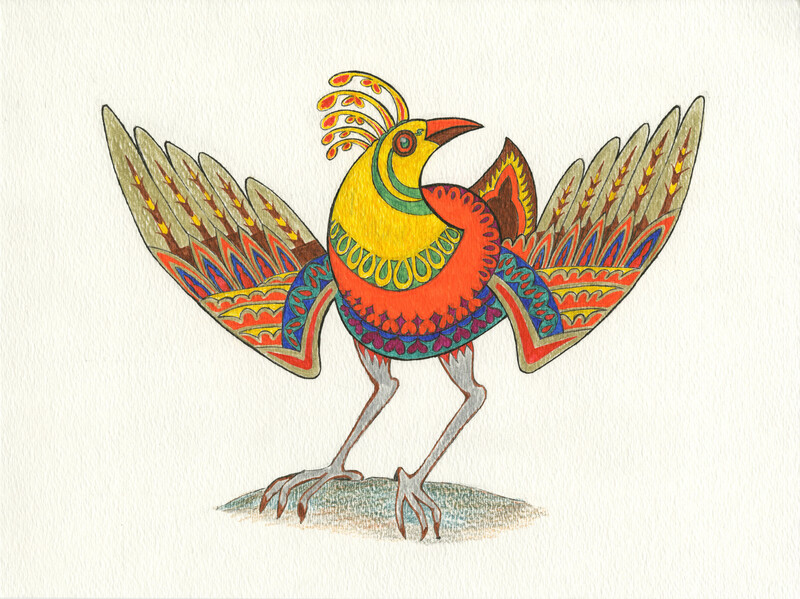 Well, it is spring and the allergies were flaring up when I sat at the drawing board about a week ago… I started with a dot that turned into a beak, and I was focused more on pattern than composition. A tune came into my head from when I was a kid playing in my parent’s backyard in Petaluma, California… the backyard was wild in its own way and a fertile place for a child’s imaginings. We had rabbits and chickens, a beloved mutt, three cats, and an occasional raccoon or blue heron would pass through. Anyway as I sang to myself, the head on the page cocked, and Mr. Wappo came into view. He is a kick with a sweet little peck, and game for good dance music. Mr. Wappo is a kickin’ chicken with attitude. Design by Meredith Eliassen, 2015. More from Lake Merced… before the spring rains. 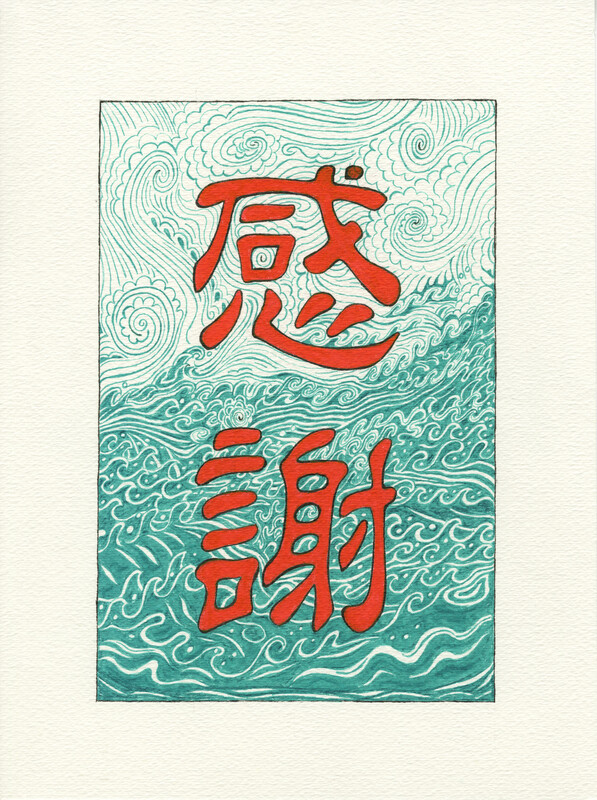 Chinese “gratitude” with I Ching graphic: “Wind over the lake: the image of inner truth.” Design by Meredith Eliassen, 2015. 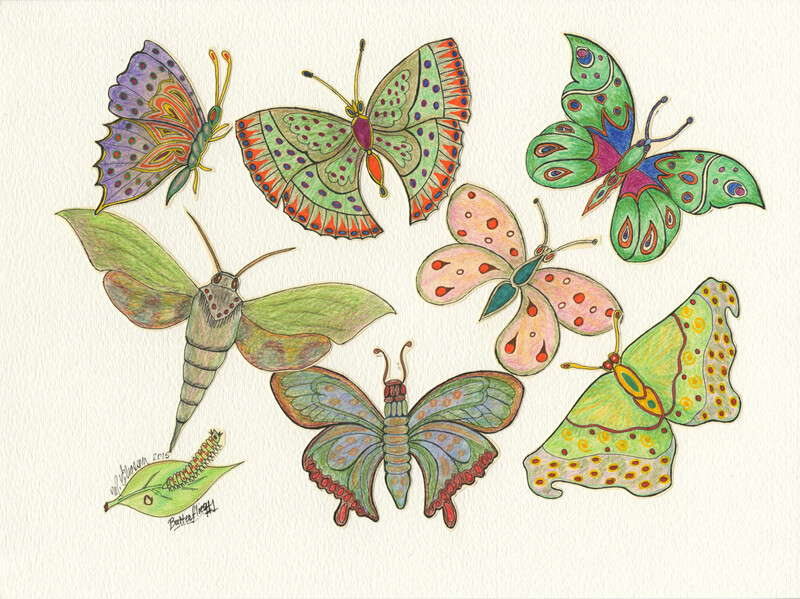 I have been playing with butterfly designs, and this is the first collection to land on paper. I draw them on cheap paper and cut them out. When the paper is cut, it curls so that the butterflies look like they will take flight. I hope to do more as time permits. “The Chase” came to me after a walk around Lake Merced. No, there is not some evolutionary happenings at the lake that I know of, but I saw a cormorant dive into the water a had a mind picture of primordial times when a bird dove in to the water and chased a fish, who sensing danger, had it fins turn into wings just in time to take flight. This image captures an imagined moment of transformation.